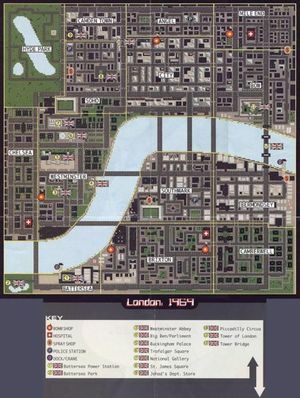 Map of London in GTA London 1969. London is the real-life capital of England and the United Kingdom. It was the city used in both Grand Theft Auto: London 1969 and Grand Theft Auto: London 1961, the two expansion packs for Grand Theft Auto 1. To date, London is the only real-life city to be used in a GTA game, as all others have been fictional cities based on real American cities (besides Anywhere City, the setting of Grand Theft Auto 2, which is entirely fictional); however, other real cities have been mentioned. London is also the only city used in any GTA game that is not part of the United States. The temporal setting has been exploited through a number of cultural and historical references, including the appearance of a James Bond-like character and the use of more or less authentic slang. In addition, the cars drive on the left side of the road, as is the case in Britain, and authentic London place names were used. This page was last modified on 10 May 2014, at 16:14.